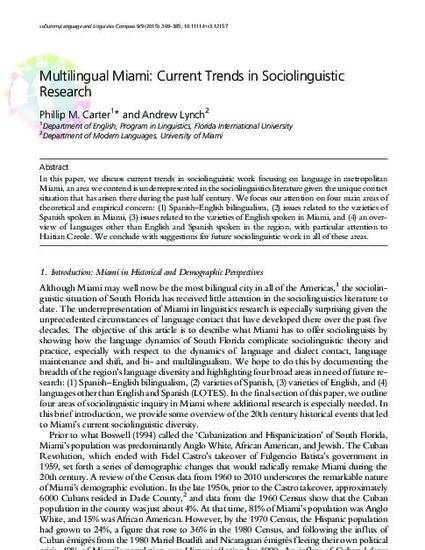 In this paper, we discuss current trends in sociolinguistic work focusing on language in metropolitan Miami, an area we contend is underrepresented in the sociolinguistics literature given the unique contact situation that has arisen there during the past half century. We focus our attention on four main areas of theoretical and empirical concern: (1) Spanish–English bilingualism, (2) issues related to the varieties of Spanish spoken in Miami, (3) issues related to the varieties of English spoken in Miami, and (4) an over- view of languages other than English and Spanish spoken in the region, with particular attention to Haitian Creole. We conclude with suggestions for future sociolinguistic work in all of these areas.